First to the Field collaboratively connects agricultural manufacturers and retailers with progressive growers to effectively evaluate new products and concepts. We deliver field tested data and ROI information to our customers, so that they can maximize production sustainably. First to the Field sets itself apart from other product evaluation programs by looking for more than just the difference in bushels per acre. Our protocol is designed in a way that allows our agronomists to fully evaluate our concept trials- from planting through harvest. Our process starts in the winter, when we sit down with growers, manufacturers, and our sales staff to identify and select which new technologies we feel offer the greatest chance to provide value to the grower. This collaborative process allows our growers unique access to our decision making process. After we have selected our concepts for the season, trial protocols are created to ensure the data we generate on each trial will be consistent and credible. Once we have established a solid foundation for our trials to succeed, it is time to find innovative growers who want to work collaboratively with the FTF Agronomy Team to place trials in environments that will give us the highest quality data possible. Growers then utilize GPS technologies to accurately record planting and as-applied maps of trials to ensure data location accuracy. After trial applications have been made, the FTF Agronomy Team heads to the field to evaluate physical performance and note any observations that are seen as a result of the applied product or practice. Once these observations are gathered, they are shared with our grower cooperators through emails, webinars, and social media. This way, we can communicate the evolving story of each trial in clear view for our customers. When harvest commences, yield data is collected and compiled at Precision Management Services of Bancroft, IA. Data is carefully scrutinized and broke down to compare treatments in similar environments so that we are drawing a product performance conclusion that can be held with confidence and replicated. Once the data is compiled, we invite all participants to an end of the year meeting to discuss trial results and decipher what technologies we found to have benefits, and which did not. This conversation, above all, will go beyond the simple numbers. Bringing together our growers, the FTF Agronomy Team, and manufacturers allows everyone to collaborate collectively in evaluating the results of these trials and how beneficial the data is. Want to become a part of the AFS Agronomy Team? The Asmus Farm Supply Demo Plots are where most First to the Field concepts are first tested. The Demo Plots consist of an assortment of small-scale plots, and were originally designed to test new products and concepts for internal product evaluation. Now, the Demo Plots serve as a stepping stone to First to the Field. Nathan Eitzmann from our Rake office is the Demo Plot Facilitator. We plant the Demo Plots with a Case IH JX80 Tractor, and a 4 row John Deere 7000 Max-Emerge Planter. 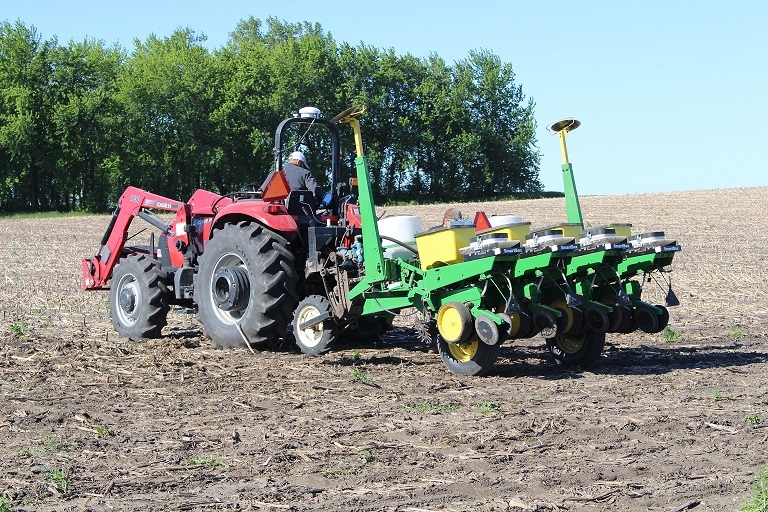 Our planter is equipped with a SmartBox system, as well as an In-furrow liquid fertilizer system. We sidedress with a 12.5ft bar, and apply crop protection productions with a tractor mounted 30ft sprayer. In the fall, we harvest with John Deere 4420 Combine. It has a 4 row corn head and 13 foot flex head to harvest corn and bean plots. Become a member of an elite group of growers in your area!